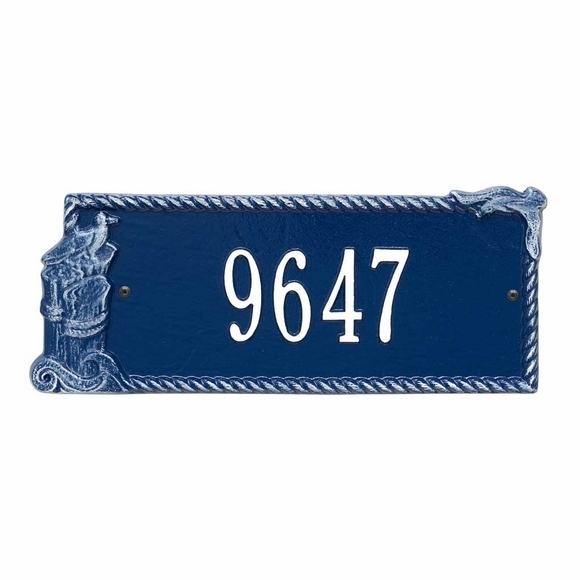 Personalized Seagull Address Sign - - wall-mount address plaque with seagull decoration. Holds one line or two lines of personalization. Made for you in the USA. Rust-free recycled aluminum address sign. On a one-line sign, Line 1 holds up to five 3" characters or seventeen (17) 1.75" characters. Note: Character size varies from 3" to 1.75" depending on the number of characters. For example, if you enter just five characters, the size will be 3". On a two-line sign, each line holds up to seventeen (17) 1.25" characters. Four color combinations: dark blue with gold, dark blue with white (large image), black with gold, bronze with gold. Small images shown in this order: blue/gold, blue/white, black/gold, bronze/gold. Custom made. Please allow 2 to 3 weeks for production and delivery. Seagull address sign holds one line or two lines of personalization.